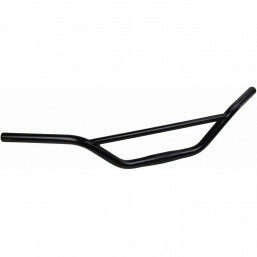 The Klunker Bar will quickly become your favorite handlebar. These upright, chromoly handlebars are the perfect position for bombing dirt roads, a trek across town to visit the new coffee shop, and loaded touring. The Klunker is 680mm wide, has a comfortable 45° sweep, and 3" (7.6cm) of rise. The clamp diameter is 25.4mm and the grip area is 22.2mm - standard outer diameters for mountain and city brakes and shifters. As a bonus, the interior diameter of the grip area is 19.4mm, so it will accept bar-end shifters.